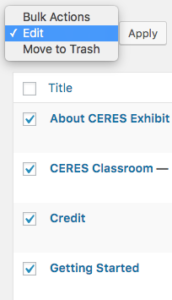 CERES: Exhibit Toolkit is built on a customized version of a theme called Quest. 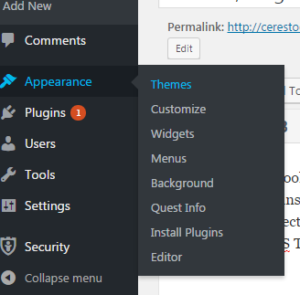 We request you do not change the theme, as all plugins and many functionalities are built to work with only this theme. Changing it will cause your site to function incorrectly. If you do accidentally change the theme, go to “Themes” under “Appearance” in the left-hand menu. This will restore the correct theme and fix your page. If you would like to use new plugins, please contact us. Not all plugins are compatible with CERES: Exhibit Toolkit, and we will have to evaluate the use of plugins on a case-by-case basis. To learn more about plugins, where to find them, and how to manage them, see the WordPress Codex. We have comments disabled by default on these WordPress sites, for convenience and to cut down on spam. It is possible to add comments both to individual pages and posts, and to your entire site. 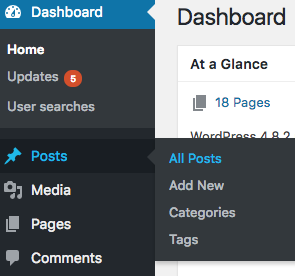 To add to individual pages or posts, navigate to “All Pages” or “All Posts” under the “Pages” or “Post” options on the left hand menu. This will open a new menu inside the page. Choose “Comments” from the drop-down boxes on the right-hand side, and then select “Allow.” Click “Update” to finish. 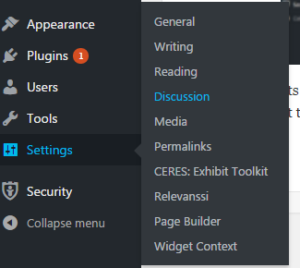 To allow comments on your entire WordPress site, click “Discussion” under “Settings” in the left-hand menu. Then, check the box next to “Allow people to post comments on new articles.” Then, click “Save Changes” at the bottom of the page.